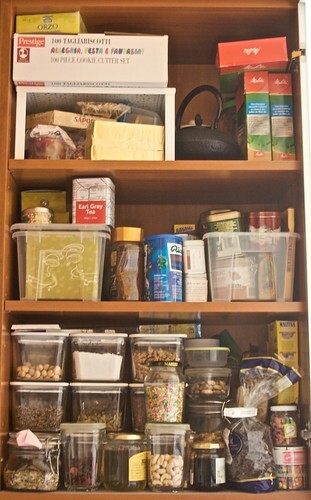 What do you really need in your pantry to be always ready to cook something? Of course the answer to this question is different for any and each of us, but there are some basic staples from which you can build your own pantry. Seeds or nuts oil, 1 lt , to fry, cook and make desserts. Better choose a 1 seed or 1 nut oil, instead of mixed seeds or nuts. White wine for cooking, 1 bottle; it doesn’t have to be expensive, but not too cheap either! Tea, in leaves. No sachet, but the real thing, the leaves. A gunpowder is perfect for a morning or afternoon tea and in the case you have to make a cup to rehydrate prunes or raisins. Wine, 1 bottle, good one, for a discomforting moment! You can download this list in pdf, to carry it with you on you mobile device (or printed) to the super market. Of course this is not a comprehensive list and none the less a list that takes in consideration allergy options. Adapt it to your style of living and taste. Fantastico, utilissima! Sara, vorrei chiederti..quelle scatole con il coperchio bianco dove le trovi? Io uso dei vasi di vetro di recupero ma non sempre sono impilabili invece qs sarebbero utilissimi! @monique: sono ikea, ma risalgono a eoni fa e infatti purtroppo non si trovano più! Utilissimi sì, perché stanno lì belli impilati da soli e sono capienti (c’erano anche capienti il doppio di quello che vedi in primo piano). In my kitchen just Stock cubes are missing, I try to avoid them and do them by myself. Dry fruits are on of the most recent introduction in my home. I’m getting crazy for them.